Entomologists with Ohio State University’s College of Food, Agricultural, and Environmental Sciences are developing a new fact sheet to provide soybean growers updated information on a stinky pest that has the potential to become a significant problem for Ohio growers. Stink bugs, known for their “sweaty feet” smell when squashed or irritated, have now made their way into Ohio soybean fields in numbers not previously experienced in the Buckeye State, said Ron Hammond, an Ohio State University Extension entomologist. Because the problem has gotten so bad, college entomologists are working on a new fact sheet to address growers’ concerns, he said. 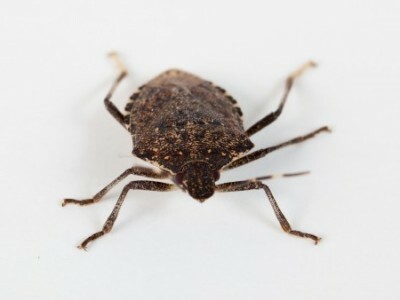 The brown marmorated stink bug was finally found in several soybean fields last year in populations large enough to notice after having entered the state a few years ago, said Hammond, who also has an appointment with the Ohio Agricultural Research and Development Center (OARDC). A native of eastern Asia, the brown marmorated stink bug was first identified in the U.S. in Allentown, Pa., in 2001. The brown, three-quarter-inch insects are known to feed on a wide range of crops, including apples, peaches, tomatoes and soybeans. Likewise, Hammond said, sightings of larger-than-usual numbers of green stink bugs have also been reported in Ohio soybean fields, as well as reports of the red-shouldered stink bug, which is a newer pest in Ohio. “Up until recently, stink bugs weren’t in populations large enough to cause a concern in Ohio,” he said. “But as these bugs begin to increase in numbers across the state, the concern for soybean growers is the potential for yield declines due to the pests, which use their piercing-sucking mouthparts to feed on the plant seeds. Hammond said last year was the first time that Ohio growers reported larger amounts of green stink bugs in their fields as the bugs are typically more prevalent in southern states. But with warmer temperatures in recent winters and summers, more of the bugs have begun traveling north, he said. To deal with the problems, growers can sample their fields for the bugs, he said. To do that, growers need to take multiple, 10-sweep samples with a sweep net in multiple locations throughout the field, he said. Then, average the number of stink bugs in the samples. Because stink bugs often occur mainly on the field edges, especially next to woody areas, growers should sample both the field edge and within the field to determine which parts of the field may require treatment, he said. More information can be found at: http://entomology.osu.edu/ag/images/StB_Factsheet_June_26.pdf .